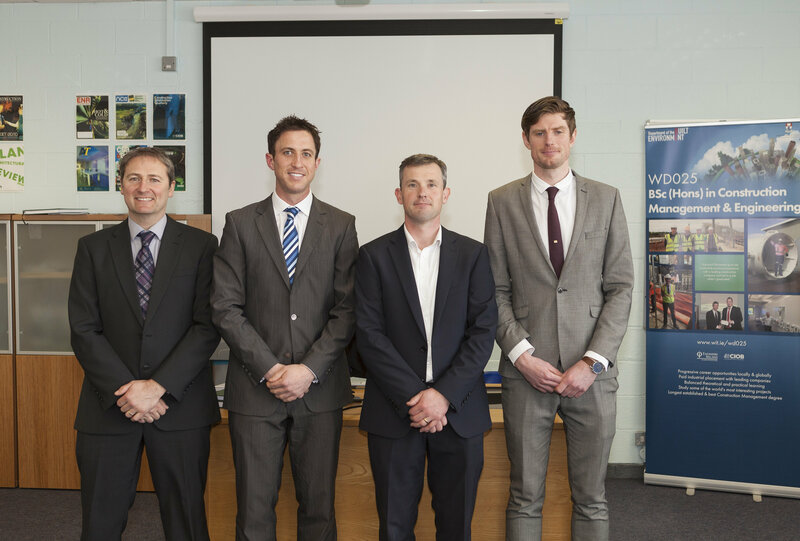 The 2016 Sisk Award was recently presented to three final year students of the Bachelor of Science (Honours) in Construction Management & Engineering programme at Waterford Institute of Technology. Recognising outstanding achievement in their final year Dissertation, Declan Gahan of Sisk, presented the awards to Lorcan Hickey, Brook Cameron and David Phelan. Over the course of their final year of study, the students were afforded the opportunity to conduct research into an area of construction that was of particular interest to them. Lorcan examined the impact of accelerating construction programmes, while Brook looked at the role of mobile computing and Building Information Modelling in enhancing the efficiency of projects. In a timely piece of research, David explored how best an existing construction company could position itself to take advantage of the upturn in building activity. Each of the Sisk Award winners delivered a presentation to an invited audience, which summarised their research conclusions and recommendations. In presenting the awards, Declan commended the students on the quality of their research and relevance to the construction industry. He also spoke about the upturn in building activity in Ireland in the past year, with Sisk currently completing numerous high-profile projects across the country. These projects include a Microsoft Campus Development and the Luas Cross City Scheme in Dublin, the redevelopment of Páirc Uí Chaoimh in Cork, and the construction of the new West Pharma facility in Waterford city. Entering its 30th year as the leading Construction Management degree in Ireland, the programme continues to excel at providing students with excellent Industrial Placement opportunities, which in many cases can lead to long term employment upon graduation. Indeed, the graduating class of 2016 have all secured employment, with demand for Construction Management graduates continuing to outstrip supply. For further information on the Construction Management & Engineering programme, please see www.wit.ie/wd025 or contact Brian Graham at [email protected].